Lyla, Honey and Uno, the canine pet therapy team at Batson Children’s Hospital, help patients forget about being ill or injured for a while. When these dogs, ranging from a Shetland sheepdog to a Labrador-chow mix, stop in, they offer children the healing power of petting a dog. 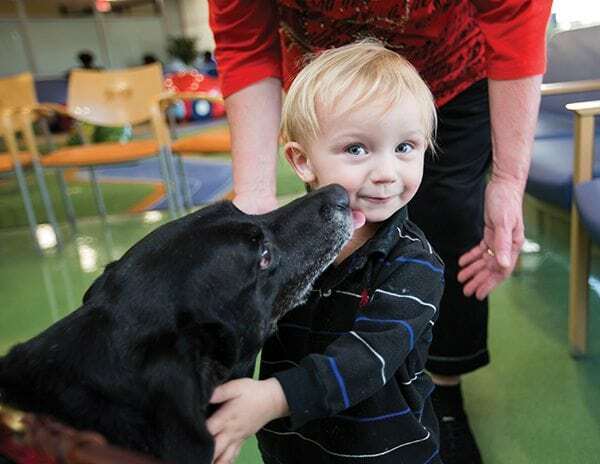 It worked for Maggie Jim of Philadelphia, a shy 4-year-old who broke into a smile at the sight of Lyla, who is an “honorary chaplain” for her pet therapy visits at UMMC’s adult hospital as well. Soon Maggie was petting the friendly dog and telling stories of her own dog back home. Raphael’s Shetland sheepdog puppy, Piper, “has a completely different personality,” she said. “We call her ‘Hyper Piper.’” Plans are for playful Piper to get certification as a pet therapy dog when she grows up. Alvin and Nancy Youngblood of Byram bring Honey to Batson each month. An impeccably groomed red poodle who loves to snack on Cheerios and Lucky Charms, Honey always gets oohs and ahhs from those who meet her. That’s saying quite a bit, as patients find time spent petting and playing with Honey as sweet as her name. Aubrey Thomas of Columbus and daughter Brookelle Perrigin visit with Uno, a pet therapy dog who visits Batson Children’s Hospital regularly. Uno got a dose of divine help as a puppy. A Yazoo County pastor, Dr. David White of Black Jack Baptist Church, had found her abandoned by a Dumpster and took her in, but the Labrador Retriever in her showed out in well-meaning rambunctiousness. The church is across the street from the church cemetery, and the parsonage, Uno’s new home, was nearby. “She started dragging home the flower arrangements from the cemetery,” White said. Then there was the matter of romping into the sanctuary and jumping on churchgoers to greet them with a wagging tail and muddy paws. Uno, the deacons said, had to go. “He knew that I love dogs, so he called me,” Speed said. Once the idea of the friendly, energetic Uno becoming a pet therapy dog took hold, the training began. Speed’s preferred method of positive reinforcement with treats was a big hit – Uno likes treats very much. Patients enjoy the now-well-trained Uno, who entertains them by fetching a dumbbell toy as many times as they will throw it.